Does your fireplace need a small sprucing? Whether your screen is worn, or your fireplace is bare, this screen is bound to transform the look of your fireplace. This Polished Brass fireplace screen is a perfect addition to any decorative scheme. 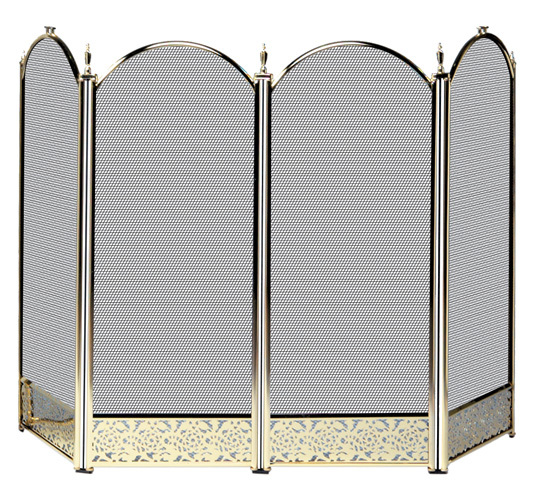 This classy screen comes complete with high-quality brass construction and elegant styling. Fire lit or not, this screen makes a regal statement. This screen protects your home from fire damage, while offering a beautiful decorative addition to your home. This screen is 4 fold with a polished brass finish. Does this screen allow air flow and heat or does it block heat? This screen is mesh, so it will allow air flow through the screen. It certainly offers good air flow. It is nice looking in-place. What is the maximum size opening the screen will cover? Are the dimensions based upon: A) the maximum opening that will be covered left to right...with the ends bent so as to provide stability.....or in a straight line....where there is little or no stability? B) Is the 32 inch maximum height measured at the apex or at the low point of each screen? I would suggest a max width opening of 33-36" (for best stability) and the height is measured at the Apex. What is the width of each panel of this Uniflame 4 fold polished brass fireplace screen with decorative filigree? Each panel is approximately 13" wide. This screen weighs about 10 lbs. How much does this fireplace screen weigh? This screen weighs 10 pounds. As always when purchasing something online, we were a little unsure if this brass fireplace screen would be as good as it looked on the picture. Well it wasn�€™t. It was even better !! We are delighted with how it looks and know we couldn't have made a better choice. All you expect and more. It is more than I hoped for. I love this screen, it really dresses up my fireplace and it's a great price for an expensive look. I have a marble fireplace that is level with the floor, and therefore felt the need for a good screen to protect the carpet from any embers which might fly out of the fireplace. I also have a fairly nice house, so the screen also had to be attractive as well as practical. I searched several sites, and finally found one that was both practical and very attractive. I ordered it, and it was delivered on time as promised in excellent condition. Now I can have a fire in the fireplace and enjoy the living room more as a family. Prior to this we gathered in the family because it has a fireplace insert, which is not that nice to look at. The price was competitive, and the product is very functional and attractive. I am very satisfied. For the person that is looking for a screen that reflects light, is able to stop all stray sparks dead in their tracks, as well as possesses a highly attractive design that is certain to capture the eye of the beholder, this product is it. We are now able to keep the glass fire doors open in our fireplace because of this screen, enabling us to more effectively and efficiently heat our home. When we used to open up the doors, embers would fly out and leave marks on the floor; now, that is not an issue. I was torn between whether I should stick with the conventional style model or one that had more fancy metal work on the front of it. I am delighted that I opted for the more time-honored look. It doesnt stick out in the room, but balances well with the whole design scheme. Light reflects back into the room off the screen but embers cant pass through. It appears to be constructed well. This screen is very dense and is really good at reflecting light. It is extremely effective in stopping the sparks that emit from the fire, and when you combine the very attractive design with an excellent price, it is simply not possible to beat this product. The design that this screen possesses could only be described as classic. It is very effective when it comes to reflecting light, and it is able to add an extra level of class to the appearance of my fireplace. When one takes into account the price, this item is a steal. When we set out to look for a cover for our fireplace, we wanted to find something that had a brass appearance as well as was able to effectively match all of our other brass colored items. Products such as this are hard to find, especially since they are now considered to be somewhat out of style. Thankfully, this is able to meet our needs, even though it is a tad bit on the light side. This really nice screen is divided up into four easy to manage parts that can be manipulated fairly easily while adjusting logs on the fire. It is quite beautiful, and I expect it to last a long time. I was simply stunned when this fireplace screen arrived. It was gorgeous in the pictures but is even more elegant as it sits in front of my fireplace. Part of my inspiration for getting this screen is to shield the faux logs from view. It does this quite well, and in the end, its elegant look adds a great deal to the overall appearance of my living room. If you don't have a large budget, I would definitely consider this fireplace screen. Like other reviews, it is a little on the light side, but it is nicer looking than the website depicts and it does a fine job. During the time that we were painting out family room, we made the decision to go ahead and replace the old, worn out screen that sat in front of our fireplace hearth. We decided upon this product as a replacement for the simple reason that we preferred the decoration at the bottom that this item possessed. So far, it has worked quite well with our fireplace and looks very nice as it sits in front of the hearth. Even though my husband needed to do some touch up on the frame, you cannot notice any of the work now! I had a fireplace screen that was a bit more substantial and seemed to be better made than this one. As I looked to replace it, I had my own image of what I was looking for and it wasnt easy to find! I was very pleased to find this brass screen in the style that duplicates the old one. I was so happy to find a screen that would fit my wide fireplace! I couldn't be happier - good looks and made to last! The screen could be larger, and the lack of weight to it makes it potentially dangerous for our oldest who likes to get into stuff. This aside, there are numerous positives: it reflects light quite easily as well as stops stray sparks and possesses a very elegant design. The design on the bottom of this fireplace screen is very attractive. It far exceeds my expectations! This product shipped on time and has proven to be an excellent buy at a terrific price. I am excited to say that this product is just what I was looking for, as well as is a good deal lighter than I had anticipated. Right away we knew we were going to love our new screen. It is very beautiful and durable. On close examination one of the panels was scratched. The company did not give us any problems and are in the process of making things right. I can recommend this product. I would have to say that this brass screen is of the best quality available. The design is very pleasing and the screen itself is dense and does a great job! If you are looking for a product that comes with a satisfactory density, possesses a very attractive appearance, as well as is able to stop the stray sparks that escape the hearth of your fireplace, then this is the product that you need to purchase and install in your living room. It does not look cheap in any way, and I am quite satisfied with the decision to purchase this product. This screen has a nice, durable look to it - so I was surprised at how lightweight and somewhat fragile it is. But even so, I like the density of the screen itself, and it reflects the flame beautifully. This is a very attractive looking product that stops sparks with great ease. Unfortunately, it is flimsy and made of cheap materials but does come at a good price. This product possesses an attractive design that is also highly functional as it sits in front of our fireplace. Everyone is very satisfied with this product. Every once in a while you make a purchase that you just feel great about. That's the case with my new screen. I still can't believe I got such a nice looking screen at such a great price! Great product for a great price. You will not be disappointed with how this screen looks. It look expensive and simplyamazing in front of a roaring fire! I am so happy I bought this screen! My living room fireplace was very drab, and this new screen has added some beauty to the room. It is just what the room needed! Most screens are purchased just to be functional, but this screenadds goodlooks to my living room! This product possesses the perfect design and is excellent in providing our gas fireplace with decoration. This fireplace screen would make a wonderful addition to any room with a fireplace. I boughtthis accurately described screenfor a family member and it just looks great and they are very happy. I really love this fireplace screen! It has a very pretty decoration on the bottom, keeps the sparks back, and I got it for a great price. This is a screen that possesses a very classy appearance that is able to reflect light in a dazzling manner. It stops the sparks from the fire, and when looking at the value one gets for this product at the price that is listed, it could only be labeled a terrific purchase. I found exactly what I had been searching for! What a great screen for my custom fireplace. This product has an excellent design that enables it to seamlessly cut down on the number of sparks that escape from the fireplace. If I needed to buy a screen, I would buy this one all over again. Originally I found the selection between fire screens to be so much better online than in the store that I decided to confine my search to the Internet. The result is this product, and I am immensely pleased.